Did you know that a baby's skin is extremely delicate and is constantly changing, making it prone to dryness and rashes! So, Softsens created the perfect solution to kiss away those rashes and keep your baby's skin clean, moisturized & healthy. 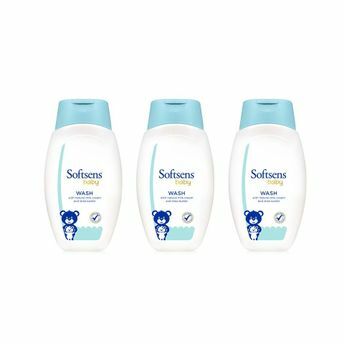 Softsens Baby Wash is the perfect cleansing ritual for your baby's delicate skin. Enriched with the goodness of Natural Milk and Shea Butter, It cleanses and nourishes your baby's skin without drying it out, making it soft, supple and completely kissable! Its "Tear-Free" formula prevents skin and eye irritations, making sure that you and your baby fall in love with bath-time! Made with 100% Natural Vegetable Oils. Free of parabens and other harmful chemicals. Infused with Natural Milk Cream and Shea Butter, which cleanses the skin without drying.